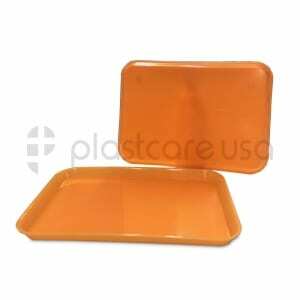 Used by dental offices to transport instruments to and from procedure rooms, these dental instrument trays are also perfect for nail and beauty salons, day spas, tattoo artists, and medical offices. Measuring 13.25” x 9.75”, our dental instrument tray setups size B will hold tools and several instrument sterilization pouches and easily fit inside of an autoclave. Made of high quality materials, these dental trays have the durability needed to endure repeated Autoclave processing and rigorous usage. Designed in our warehouse in California, we are proud to have added 4 rubber grips placed on the bottom side of each tray. This eliminates any possibility of a tray full of tools sliding off a table or cart during a procedure. Available in 8 beautiful colors: Blue, Gray, Green, Pink, Yellow, Purple, Orange, and White.